Marie-Henri Beyle (French: ; 23 January 1783 – 23 March 1842), better known by his pen name Stendhal (French: or ; in English , , or ), was a 19th-century French writer. Best known for the novels Le Rouge et le Noir (The Red and the Black, 1830) and La Chartreuse de Parme (The Charterhouse of Parma, 1839), he is highly regarded for the acute analysis of his characters' psychology and considered one of the earliest and foremost practitioners of realism. The military and theatrical worlds of the First French Empire were a revelation to Beyle. He was named an auditor with the Conseil d'État on 3 August 1810, and thereafter took part in the French administration and in the Napoleonic wars in Italy. He travelled extensively in Germany and was part of Napoleon's army in the 1812 invasion of Russia. Stendhal witnessed the burning of Moscow from just outside the city. Stendhal was appointed Commissioner of War Supplies and sent to Smolensk to prepare provisions for the returning army. He crossed the Berezina River by finding a usable ford rather than the overwhelmed pontoon bridge, which probably saved his life and those of his companions. Stendhal arrived in Paris in 1813, generally unaware of the general fiasco that the retreat had become. Stendhal became known, during the Russian campaign, for keeping his wits about him, and maintaining his "sang-froid and clear-headedness." He also maintained his daily routine, shaving each day during the retreat from Moscow. 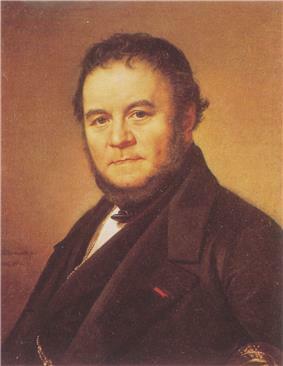 Before settling on "Stendhal", Stendhal published under many pen names, including "Louis Alexandre Bombet" and "Anastasius Serpière". The only book that Stendhal published under his own name was The History of Painting (1817). From the publication of Rome, Naples, Florence (September 1817) onwards, he published his works under the pseudonym "M. de Stendhal, officier de cavalerie". He borrowed this nom de plume from the German city of Stendal, birthplace of Johann Joachim Winckelmann, an art historian and archaeologist famous at the time. In 1807 Stendhal stayed near Stendal, in Brunswick, where he fell in love with a woman named Wilhelmine, whom he called Minette, and for whose sake he remained in the city. "I have no inclination, now, except for Minette, for this blonde and charming Minette, this soul of the north, such as I have never seen in France or Italy." Stendhal added an additional "H" to make more clear the Germanic pronunciation. Stendhal used many aliases in his autobiographical writings and correspondence, and often assigned pseudonyms to friends, some of whom adopted the names for themselves. Stendhal used more than a hundred pseudonyms, which were astonishingly diverse. Some he used no more than once, while others he returned to throughout his life. "Dominique" and "Salviati" served as intimate pet names. He coins comic names "that make him even more bourgeois than he really is: Cotonnet, Bombet, Chamier." He uses many ridiculous names: "Don phlegm", "Prosper Mérimée, said: "He never wrote a letter without signing a false name." Stendhal's Journal and autobiographical writings include many comments on masks and the pleasures of "feeling alive in many versions." "Look upon life as a masked ball," is the advice that Stendhal gives himself in his diary for 1814. In Memoirs of an Egotist he writes: "Will I be believed if I say I'd wear a mask with pleasure and be delighted to change my name?...for me the supreme happiness would be to change into a lanky, blonde German and to walk about like that in Paris." Contemporary readers did not fully appreciate Stendhal's realistic style during the Romantic period in which he lived; he was not fully appreciated until the beginning of the 20th century. He dedicated his writing to "the Happy Few" (in English in the original). This can be interpreted as a reference to Canto 11 of Byron's Don Juan, which refers to "the thousand happy few" who enjoy high society, or to the "we few, we happy few, we band of brothers" line of Shakespeare's Henry V, but Stendhal's use more likely refers to The Vicar of Wakefield by Oliver Goldsmith, parts of which he had memorized in the course of teaching himself English. In The Vicar of Wakefield, "the happy few" refers ironically to the small number of people who read the title character's obscure and pedantic treatise on monogamy. As a literary critic, such as in Racine and Shakespeare, Stendhal championed the Romantic aesthetic by unfavorably comparing the rules and strictures of Racine's classicism to the freer verse and settings of Shakespeare, and supporting the writing of plays in prose. Today, Stendhal's works attract attention for their irony and psychological and historical dimensions. Stendhal was an avid fan of music, particularly the works of the composers Cimarosa, Mozart and Rossini. He wrote a biography of Rossini, Vie de Rossini (1824), now more valued for its wide-ranging musical criticism than for its historical content. Hippolyte Taine considered the psychological portraits of Stendhal's characters to be "real, because they are complex, many-sided, particular and original, like living human beings." Emile Zola concurred with Taine's assessment of Stendhal's skills as a "psychologist", and although emphatic in his praise of Stendhal's psychological accuracy and rejection of convention, he deplored the various implausibilities of the novels and Stendhal's clear authorial intervention. The German philosopher Friedrich Nietzsche refers to Stendhal as "France's last great psychologist" in Beyond Good and Evil (1886). He also mentions Stendhal in the Twilight of the Idols (1889) during a discussion of Dostoevsky as a psychologist, saying that encountering Dostoevsky was "the most beautiful accident of my life, more so than even my discovery of Stendhal". Vladimir Nabokov was dismissive of Stendhal, in Strong Opinions calling him "that pet of all those who like their French plain". In the notes to his translation of Eugene Onegin, he asserts that Le Rouge et le Noir is “much overrated,” and that Stendhal has a “paltry style”. In Pnin Nabokov wrote satirically, "Literary departments still labored under the impression that Stendhal, Galsworthy, Dreiser, and Mann were great writers." ^ The pronunciation is the most common in France today, as shown by the entry "stendhalien" () in the Petit Robert dictionary and by the pronunciation recorded on the authoritative website Pronny the pronouncer, which is run by a professor of linguistics and records the pronunciations of highly educated native speakers. The pronunciation is less common in France today, but was presumably the most common one in 19th-century France and perhaps the one preferred by Stendhal, as shown by the at the time well-known phrase "Stendhal, c'est un scandale" as explained on page 88 of Stendhal: The Red and the Black by Stirling Haig. On the other hand, many obituaries used the spelling "Styndal", which clearly indicates that the pronunciation was also already common at the time of his death (see Literaturblatt für germanische und romanische Philologie, Volumes 57 to 58 [in German], p. 175). Since Stendhal had lived and traveled extensively in Germany, it is of course also possible that he in fact pronounced his name as the German city using /ɛn/ instead of /ɛ̃/ (and perhaps also with /ʃ/ instead of /s/) and that some French speakers approximated this but that most used one of the two common French pronunciations of the spelling "en" ( and ). ^ Talty, Stephan. The Illustrious Dead: The Terrifying Story of How Typhus Killed Napoleon's Greatest Army. Three Rivers Press (CA), ISBN 9780307394057, p. 228, quote="We resemble our lackeys," wrote the novelist Stendhal, an officer in the commissariat, who was still among the luckiest men on the retreat, having preserved his carriage. "We are far removed from Parisian elegance." ^ Cited by Joanna Richardson in Stendhal, Coward, McCann & Geoghegan 1974, p. 68. ^ Cited by Mariella Di Maio in her preface to Aux âmes sensibles, Lettres choisies, Gallimard 2011, p. 19. ^ Cited by James Wood in How Fiction Works, Macmillan, 2008 pp. 165 ISBN–9780374173401. Ann Jefferson, Reading Realism in Stendhal (Cambridge Studies in French), Cambridge, UK: Cambridge University Press, 1988.